Uh oh.. stai incide dat bawl. ai had a hammsturr an Minkey teh hammsturr hadda libbertie bawl lyke taht. He lyked tew lurk inn teh dark baffrum. gave mai gurl visitors kwite a start wehn tehy used teh fasility an sunnenly sumfing brushed up against thare legs. (mai kitteh at teh thyme-Twinks-was askared uf teh Minkey. heers teh burfday fairy to say HAPPEE BURFDAY to Crossfire905, Edinah, Barkymark, Bostoncat an evreewun else hoo haz a burfday today! 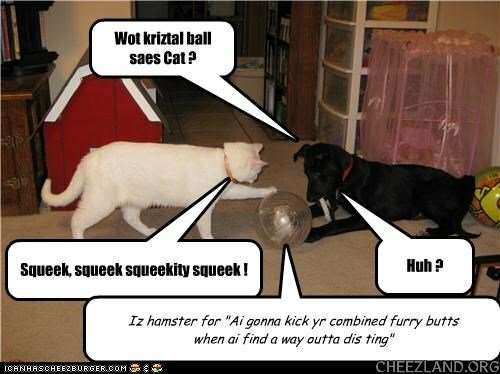 i haz bringd yummy fudjy burfday caeks, wite caeks wif fluffy orinj frosting, iskreem, sparkly party punch, fansee shiny party hats, an goodie bags filled wif yoyos that lite up wen they yoyo, faymuss lolcats finger puppets, kandee, an glo-in-teh dark funny face stikkers! an a big swish ob teh burfday wand to making all yor burfday wishes come troo!